The Canon EOS 1Ds Mark II is a top model in the Canon EOS DSLR line, with a full-frame 16.7 MP CMOS sensor. A professional grade camera body, the EOS 1Ds Mark II is large, ruggedly built, and is dust/weather-resistant. The Mark II is the successor to the 11.4 MP Canon EOS 1Ds and has been replaced by the 21.1 MP Canon 1Ds Mark III. Performance is another area which impresses, of course we all expect a professional digital SLR (especially one with this price tag) to operate quickly and be instantly responsive to our every request. But when you consider that this camera wasn’t designed for the fast-shooting sports market it’s equally amazing to use it and realize that in many ways it is just as capable at continuous shooting as it is at delivering superb resolution. Four sixteen megapixel frames per second for 41 frames without stopping is something mighty. In the end, the 1Ds Mark II stands alone, (for the moment at least), as the camera with the combination of highest image quality and fastest handling available. There are faster cameras and there are higher resolution digital solutions (various 22 Megapixel backs, and soon the Mamiya ZD 22 MP camera). But for the money, the size, the versatility, and the performance, the Canon 1Ds Mark II is currently king of the hill. Very clean files up to ISO 400. Even ISO 800 looks excellent and ISO 1600 is very useable too. This seconds the findings we had with some real world nature shots in Sedona that behaved very well at ISO 400. This excellent ISO behavior is more important to us than even the extra resolution. Is the Canon EOS 1D Mark II for professionals only? Definitely not. Having excellent quality in-focus images appeals to a large number of non-professional enthusiasts as well. Keep in mind – all of us are capable of taking bad pictures with the best camera available. The Canon EOS 1D Mark II has the ability take your photography to a very high quality level. The Mark II is an excellent value for the pro who needs its increased resolution and improved performance, and to the extent that the Mark II enables them to earn more income, they will buy it. But to the rest of us mere mortals, justifying an $8000 camera plus the necessary upgrades in computer and memory resources is a big stretch, one not many enthusiasts and semi-pro’s will make. Looks like someone let the cat out of the bag a little early. So, when should we expect the 40D and what are the features? First, this is speculation, however, it’s a somewhat educated guess based on recent developments in the Canon EOS DSLR product line. Expect the release of the Canon 40D to correspond with the official announcement at the PMA this year, March 8-11 in Las Vegas, NV. Almost every product cycle and release announcement corresponds with either PMA or Photokina (in the fall every 2 years). 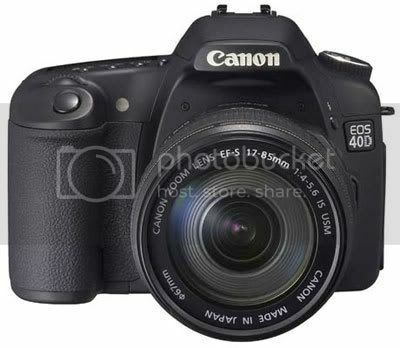 That said, I think most folks would now consider it a fact that the 40D will be announced/released shortly before or during the PMA show in March. However, I’d expect you’ll be able to actually put your hands on one near the end of March or beginning of April. The Nikon D2H is 4.1 MP DX format professional DSLR, which was introduced in July 2003. Nikon refined and replaced the D2H with the D2Hs in 2005, adding new features developed with the flagship D2X Digital SLR. See a comparison of features improvements and changes between the D2H and D2Hs at DP Review. Acuity is good, color is excellent, and noise performance is at least as good as previous Nikons, if not better. With the right settings and discipline, this camera performs more like a 5mp or higher camera. The Nikon D2H is one of a very few cameras which feels almost perfectly ‘sorted’. By this I mean it’s very difficult to use the camera and find faults, almost any faults, which will affect the camera’s purpose in life, which is to be a very fast, flexible, robust and reliable photographic tool. Underpowered? Not necessarily …. the 4.1 megapixel sensor actually could be considered to be a strong point because of its smaller, easier to manage image file sizes. Practically speaking, the smaller file sizes are faster & easier to work with. In some ways the D2h is a huge improvement over the professional standard D1H camera. Advantages are much, much better battery performance and a much bigger LCD screen. A big disadvantage of the D2H is the lack of an electronic shutter which drops the flash sync speed. Image quality generally matches or exceeds the D1X and D1H Saturation is up, detail is up, noise across the range of ISOs looks to be slightly worse while skin tones seem to be both up and down, depending on the subject and illumination. The D2H was nearly transparent as I used it; it did not demand my attention or make me wait, and allowed me to concentrate my efforts on capturing images, not operating a camera. Clocking my camera, it seems to be delivering about 8.61FPS shooting above 1/250. That’s pretty darn cool. Coupled with the ability to shoot RAW + JPEG, it’s a great system. I’ve said before and will say again that the D2H is easily the most enjoyable camera to shoot with that I’ve yet handled, with a fluid, fast, and easy to use user interface that intrudes minimally on the shooting experience. Overall, a powerful photographic tool, not to mention a thoroughly enjoyable one. First off, consider going to your local camera store (and I don’t necessarily mean Wolf Camera at the mall). By going to your local camera store, you’re supporting your community and you just might build a lasting relationship with people you can rely on when you need some help or answers. If you’re buying online, I recommend sticking with Amazon, B&H Photo or Adorama. Frequently, you can find used or refurbished models on these sites. These three vendors are reliable, trustworthy and generally have the best (legitimate) prices. Additionally, purchasing your camera through these links helps support this site. The Nikon D2X is the predecessor to the Nikon D2Xs, both of which are 12.2 MP professional DSLRs. The technical specifications can be found here on Nikon’s website. The Nikon D3 was introduced in August 2007 and offers several upgrades. The D2X is a camera which grew on me the more I used it, its instant response and solid build instill a level of confidence unavailable in lesser cameras. You know that every time you press the shutter release the camera will respond instantly and you’ll get the shot. As a photographic tool it’s as close to perfection as I could imagine, there’s really very little else you could want from a camera. Frankly, the D2x is more camera than many amateurs can handle–they simply don’t have the shot discipline (or the lenses) to get all the bits of resolution of which the camera is capable (pardon the pun). Pros shooting for large formats may find a deeper discussion of resolution slightly useful, but when I have to get out a magnifying glass to examine differences printed at 13×19″ on my Epson 2200, I think that we’re beyond the point where 90% of the market will find that discussion useful. For the pros: you’ll need Nikon’s best lenses to fully achieve what the D2x is capable of capturing, and, yes, we really are in the realm of better-than-35mm resolution. What makes the D2X special is its fantastic high speed, instant response, brutally fast autofocus, superb usability and construction so solid you can use it for self-defense. The Nikon D2X is a bit of an enigma. With both full-frame and High Speed Crop modes, it is versatile like no other camera, equally at home in a studio or a sports arena. It is feature rich, offering the exposure controls and Custom Settings demanded by professionals. Its 12.4 megapixels of resolution, while lagging the 16.7-megapixels of Canon’s 1Ds Mark II, set a new standard for Nikon and will be well-received by those with large investments in Nikon glass. The Nikon D2X is definitely one of the best D-SLRs available these days. Especially looking at its price the D2X offers a heck of a lot and therefore it’s not a surprise seeing the D2X regularly in the field. It’s a special professional reflex! A CMOS sensor uses less electric power than a CCD sensor. This has a couple of major benefits. First, longer battery life. Second, less static buildup, which means less dirt & dust attracted to the sensor’s cover glass surface. Many experienced D2X users report that they seldom or never need to clean their camera’s sensor. Throughout my testing, the Nikon D2X delivered excellent color, hue-accurate, and with appropriate saturation. If your present camera does what you need it to do then you may not need a Nikon D2X. There is no need for a D3 in my future. It will take many years and many venues to test all of the D2X’s benefits and features. This one does what I need it to do, now. The future is here for me, and it is … the Nikon D2X. The cameras overall feel is quite powerful and ”tank” like which I prefer, The high speed crop mode is a one button push and a turn of the command dial, Sports guys are gonna love this as a 300 lens becomes a 600 lens and is clearly defined in the viewfinder with a highlighted grid. Also Very cool! The monitor is huge and extremely good, just remove the monitor protector and get those Hoodman stick-ons, they are great. The Nikon D70s, introduced in early 2005, is 6.1MP DSLR and essentially an update of the D70, adding a larger LCD screen 2″ instead of 1.8”. The D70s also comes with the newer EN-EL3a battery with slightly higher capacity. Same as D70, which is excellent. Sorry, no surprises. This is great, since I love how my D70 operates. In terms of features, the D70s has plenty. Full manual controls? Check. White balance fine-tuning? Yep. Bracketing of all types? That’s here too. Some things like white balance controls aren’t quite as nice as what Canon is doing these days, but most people will be satisfied with what the D70s offers. The playback mode doesn’t do anything fancy but the important features are all there and everything is responsive. Seeing that Nikon already had a very good DSLR in the D70, it is interesting to see that they still managed to improve the camera with a number of welcome features. Among these is the new 1500mAh battery with a capacity of up to 2500 images per charge. Flash angle coverage has been improved to cover lenses up to 18mm and a comfortable rubber eye cup is now supplied as standard. With the introduction of the D70s, Nikon has refined its most popular dSLR. There is no increase in resolution or responsiveness, usually hallmarks of new models, over the D70 we reviewed in 2004, but you’ll find several improvements that add to its appeal, including a larger 2-inch LCD monitor, a higher capacity battery, faster image recording, improved autofocus system and the ability to attach a remote shutter release; while not revolutionary, Nikon’s efforts have made an already good camera even better. The Nikon D70s is fully packed with intelligent software and with the knowledge that this model got the intelligence of the Nikon D2X camera…. Versatile drive mode; excellent dynamic range, noise levels, and color rendition; full feature set with lots of customization options; responsive operation; solid battery life. If you’ve handled a D100, you can pick up a D70 or D70s and start shooting. A few subtle twists will show up (and I’ll get to those), but Nikon didn’t bother to try to fix things that weren’t broken. Better still, they did fix things that were broken. The Nikon D70s offers a wealth of features, fast and accurate operation and solid build quality at a price point that would have been difficult to believe only a couple of years ago. Negative points are few – it “only” has 6 megapixels (although this is more of a marketing thing than anything else), the Multi Selector arrow-pad is spongy and unresponsive, and the shutter release mechanism is on the noisy side. The Nikon D70, which is a 6.1 MP DSLR introduced at PMA in 2004, was Nikon’s first consumer-friendly camera. At an initial price point of $1299, it was aimed to directly compete with Canon’s $999 Digital Rebel (aka 300D). Even with the consumer-level price tag, the camera could hold its own at the time against stiffer, pro-level gear – including Nikon’s own D100. A little publicized feature is that the D70 has the most accurate exposure metering system I’ve ever used. It gives me the correct exposure in almost every bizarre situation I throw at it, including fill flash and mixed light. Yes, the published meter hardware specifications are the same as the F5 and D1X, however the firmware that makes it work has clearly advanced so I almost never have to compensate the meter. They have improved the performance of the camera, with its instant on availability, very fast shutter release, superb continuous shooting and image processing speed and smart use of its buffer. The Nikon D70 is an excellent camera, built on their experience with the D100. It appears that many of the suggestions for improvement around the software, features and user interface with the D100 have been incorporated into the D70. Leaving a relatively short wish list of remaining improvements. The D70 takes beautiful photos when used well, and can give almost any digital SLR on the market a run for the money in image quality. We may quibble about slight differences in color, or noise, or aliasing between different models, but these discussions are no different than the Provia versus Ektachrome type of debate. In short, expect to produce darn good results out of this camera. It offers excellent shooting performance and image quality, while providing the photographer with fully-functional auto exposure and auto focusing controls. Users of consumer digicams will find that the D70’s responsiveness, viewfinder clarity, and image quality at high ISO settings overcome the limitations of their current equipment. In terms of performance, the D70 is truly amazing. It starts up instantly, focus quickly (even in low light), has no shutter lag, and an impressive 3 frames/second burst mode. Even playback mode is fast. The camera has more manual controls than the Canon Digital Rebel, including a bunch of custom options that let you choose how your camera functions. The Nikon D70 is a terrific camera with excellent build quality that delivers near perfect images at a price that is superb value for money. Its specifications and performance are much more advanced than Canon’s EOS 300D and even Nikon’s own D100 will have a hard time competing against the Nikon D70. It’s a tremendously capable d-SLR that noticeably advances the state of the art for cameras anywhere close to its price point. The lens it ships with is first-rate, with a wider focal-length range and faster maximum aperture than the Canon equivalent, and the camera itself just feels good in the hand. It’s also remarkably responsive, with true instant-on availability, a responsive shutter, and truly exceptional continuous-shooting ability. First off, consider going to your local camera store (and I don’t necessarily mean Wolf Camera at the mall). By going to your local camera store, you’re supporting your community and you just might build a lasting relationship with people you can rely on when you need some help or answers. If you’re buying online, I recommend sticking with Amazon, B&H Photo or Adorama. These three vendors are reliable, trustworthy and generally have the best (legitimate) prices. Additionally, purchasing your camera through these links helps support this site. You can still find some used a refurbished and used D70 bodies popping up on these sites. The D2Xs is the predecessor to the Nikon D3, which was announced on August 23, 2007. For the working professional who can use its many attributes and who is tapped into the Nikon system of lenses and accessories it is state of the art, and should remain so for some time to come. 12mp is a lot of data, and puts us into the realm of “that might be all we need.” Acuity is good, color is excellent, and noise performance is excellent at low ISO values and acceptable at higher ISO values. With the right settings and discipline, this camera performs at the state-of-the-art. The introduction of the Nikon D2xs gives professional photographers yet again the choice of upgrading their digital workflow with the latest Nikon technology. The Nikon D2x already proved itself as a professional tool for the Pro and was awarded with diverse Award recognizing the importance of the top model of Nikon’s assortment of digital SLR cameras. Nikon’s flagship dSLR ranks among the best 35mm-format cameras currently made, but some pros may take umbrage with its less-than-full-frame sensor. The Nikon D2Xs’ performance was impressive overall, starting with a startup time that was really faster than our human reflexes. Shutter lag was excellent regardless of lens position or “prefocus” (halfway pressing and holding the Shutter button before firing the shutter) status. Shot-to-shot cycle times were very good, at about 0.2 seconds for large/fine JPEGs, and the camera captured as many as 18 frames at this rate before it needs to slow down and clear the buffer. The D2Xs is a minor upgrade to Nikon’s D2X. Among the D2Xs’s notable features are 11 selectable autofocus points, nine of which are cross-type sensors; excellent tracking autofocus modes; interchangeable focusing screens; both TIFF and RAW capture; an advanced battery meter; a time lapse mode; an advanced multiple exposure mode; voice annotation; numerous color options; and 40 custom settings. If you earn your living with your camera you’ll want one of these. If you want a camera to take with you for fun, relaxation and vacation this isn’t it: it’s a huge, hulking beast of a pro camera. The Nikon D200 is a DX format 10.2 megapixel DSLR and is the predecessor to the Nikon D300. Both are slated as Nikon’s “advanced amateur” models and have a number of pro-level features while still keeping the price in the reach of serious amateur or semi-pro photographers. The D200 incorporates a weather-sealed magnesium alloy body, an 11-point AF system and 5 frames per second shooting capability, among others. With features such as these, it is often found in professionals’ camera bags as a backup to the likes of the Nikon D2Xs. It’s one of those cameras which you look forward to picking up, I really got on with its design and ergonomics, it’s small enough not to break your back yet sturdy enough to feel absolutely purposeful, solid and reliable. It fills the photographer with an air of confidence that each time they need it the camera is going to perform. Was the wait for the D200 worth it? Absolutely yes. D100 owners especially should be very happy with their upgrade. Better-than-35mm resolution? Check. Better color? Check. Better metering, AF, and white balance? Check. Improved handling? Check. More pro features? Check. Anything broken in the process? No. Having used both pro and amateur cameras for many decades, the professional élan with which the D200 dispatches its duties is something I appreciate compared to the D70s. It just feels better. These finesse issues never come across on paper, but are obvious when you pick up the camera and start working. For the semi-pro or pro photographer the D200 D-SLR could be the perfect solution and they can have it functioning as a second camera, an all-round backup. The built-in features and technique, inherited from the professional D2x, are just great. The technique is high-level and for its price you will get just about everything you could wish for. With a host of features typically reserved for professional cameras, 10.2-megapixels of resolution and excellent image quality, Nikon has not only surpassed Canon in the enthusiast market, they have blurred the distinction with their own professional D2X. As you might expect, camera performance is first rate. The D200 starts up instantly, focuses quickly, and there’s no shutter lag or delay between shots. The continuous shooting mode was amazing, especially with a high speed memory card. Aggressively priced and stuffed with pro-quality features, the rugged Nikon D200 digital SLR offers the best of the D2X at about one-third the price. 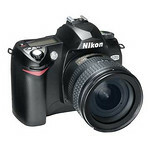 The Nikon D200 delivers excellent 10 megapixel images, and it’s easy for the experienced photographer to operate. It’s an excellent step-up camera for photographers buying a second Nikon DSLR, or for experienced film users who are finally jumping to digital (do such people still exist?). A great part of the appeal of the D200 is its combination of 10.2 megapixel resolution and 5 frame/second continuous shooting speed. It also has a very deep buffer memory, and is no slouch when it comes to offloading images to a host computer either. All in all, an impressive performer by almost any measure. 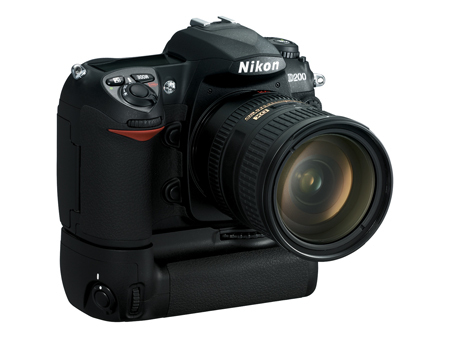 The Nikon D80 is a 10.2 MP DX format DSLR which was introduced in August 2006. 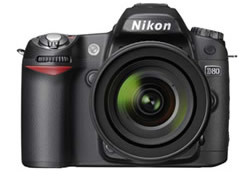 It is slotted above the Nikon D40/D40x and below the D200/D300 in Nikon’s lineup. The D80 uses an SD memory card, rather than the CF card storage used in the D70, D70s and D200. The higher storage capacity SDHC standard is also supported by the D80. The D80 body retails at $1000 and is available in a kit with the Nikkor AF-S DX 18-135 mm f/3.5-5.6G IF-ED lens at a retail price of $1300. The D80 can be found at a significant discount, however, on the street. It’s one of those cameras which just feels ‘right and sorted’ from the moment you pick it up. Things just get better the more you use the camera, you will begin to discover the usefulness of major features like the customizable automatic ISO and the subtle touches like being able to tap the DELETE button twice to delete an image (sounds insignificant, but in use things like this make the D80 far more usable than other cameras). 10mp is a lot of data, and the D80 in some ways does it better than the D200 (at least for JPEGs). Acuity is very good with careful sharpening, color is excellent, and noise performance is excellent at low ISO values and more than acceptable at higher ISO values. With the right settings and discipline, this camera performs near the state-of-the-art. This is a heck of a camera, and one that should be at the top of your list if you’re buying your first D-SLR. If you have a D50 or D70 then I’d strongly consider upgrading. And, unless you need a faster burst rate and even more custom functions, then you can save hundreds by skipping the D200 and getting the D80 instead. My D80 has the same great image sensor, LCD and viewfinder of my D200 jammed inside a smaller, lighter body like a D50. It’s the same price as the D70 was in 2004: $999. This makes the D80 a screaming deal if you want the most pixels. Shooting with the Nikon D80, we found it to be a very responsive camera in all respects. Startup was quick enough that you’re never likely to notice, shutter lag was low, and shot to shot cycle times in both single-shot and continuous mode were very good. It falls short of its big brother the D200 in several areas, but that’s to be expected, given the substantial price difference between the two models. Existing Nikon users won’t be disappointed with this new model as the company have more than met the challenge of producing a camera with suitable features coupled with fantastic image quality for the enthusiast and beginner DSLR user. The Nikon D80 is now part of a crowded market place and there is even plenty of crossover between this model and Nikon’s own 10 megapixel D200 model. With the D80, Nikon has proven that it is very much still pushing ahead strongly. With 10.2 megapixels, lightning-fast performance, high-quality images with very low noise, and a heaping pile of convenience features, Nikon’s D80 will not disappoint. In short – it’s a mixed bag of goodies. A lot will appeal to the prosumer, and a lot will also appeal to the first-time DSLR buyer or upsell customer. The Nikon D80 is without a doubt a very classy camera. It feels great, handles well, performs superbly and has one of the best viewfinders around. At times when rivals struggled with various lighting conditions, the D80’s metering remained unfazed and quite simply delivered great-looking images every time. 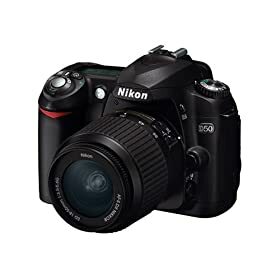 The Nikon D50 is a 6.1MP DX format DSLR. When introduced, the camera carried a retail price of $799 for the body only or $899 with a new 18-55mm f/3.5-5.6 G AF-S DX lens. The D50 was also available in a kit containing both the 18–55mm and a 55–200mm f/4-5.6 G AF-S DX lens. The D50 was replaced by the Nikon D40 in 2006. You can still find this camera in used and refurbished condition at a variety of photo equipment sellers. The nicest thing about the D50 however is that it just feels right, build wise it’s a step above the Canon EOS 350D and Pentax *ist DS, it’s also not too small, I’m all for making cameras lighter but there’s a limit as to how small you can make an SLR before the hand grip feels cramped and controls begin to get in the way. The D50 feels as responsive as any film camera and is a pleasure to shoot with. The only change I would make would probably be a larger viewfinder view (like that of the Pentax *ist DS). Back in 2006, the Nikon D50 was a great camera for basic photographers, non-photographers or backup. Image quality is identical to the D70 and D70s, which means brilliant 12 x 18″ prints that many people confuse with prints from a medium format film camera. Camera performance is superb: just flip the power switch and the D50 is ready to go. The camera focuses quickly and takes pictures without any noticeable shutter lag. Autofocus speeds were impressive, even in low light. While battery life isn’t as good as the D70s, it’s still excellent (and you can buy a higher capacity battery if you need to). Transferring photos is actually faster on the “cheap model” because it supports USB 2.0 High Speed, unlike the D70s. If you are serious about expanding your hobby though but are in doubt about which one to go for, take a good look at which functions you would really need, as the differences between the D50 and D70s are fairly minimal. The D50 may be lighter and more compact but some more advanced functions are less accessible. The D70s is definitely more bulky but feels more professional, while offering instant access to functions like metering or bracketing. It has white balance and ISO fine-tuning, a top shutter speed of 1/8000, DOF preview and the option for wireless flash control. If you feel that you would never use these functions anyway, go for the D50 and you will live happily ever after. The D50’s image quality was excellent. Its exposure and autofocus system complemented each other, producing sharp, well-exposed images. The 5-point AF system is fast and accurate, and its predictive focus tracking is able to keep up with moving subjects. Image noise was not an issue with the D50. At ISO 200 and 400 noise was essentially absent. Shadow noise is detectable in images captured at ISO 800, and noticeable at ISO 1600, but highlight noise is remarkably low even at ISO 1600. The drawbacks are all minor compared to the pluses. The D50 takes beautiful photos when used well, and can give almost any low-cost digital SLR on the market a run for the money in image quality. In short, expect to produce darn good results out of this camera. The latest result of this process is the new Nikon D50 digital SLR, delivering most of the features that made the D70 such an exceptional product, but at a lower price point and with the camera’s size and user interface retooled somewhat to better match the needs of the “family photographer.” – Or anyone else who wants a feature-rich, easy-to-use, compact (but not too much so) digital SLR for a bargain price. What was most surprising to me about the D50 though, was that its image sensor and some aspects of its image quality (notably noise levels) are actually superior to those of the higher-priced D70S. All in all the Nikon D50 is an excellent digital SLR camera. Ideal for those who have outgrown their compact camera or for those who want to take their first steps into digital photography. The Nikon D50 may be a so-called entry level model; nevertheless it offers the user almost everything. This is a great little camera and a fine choice for a new photographer. It has a very agreeable personality that makes photography a pleasure. More advanced photographers might want to step up to the Nikon D70s for some of the additional features and greater media compatibility that camera offers, but many might be satisfied with the Nikon D50.